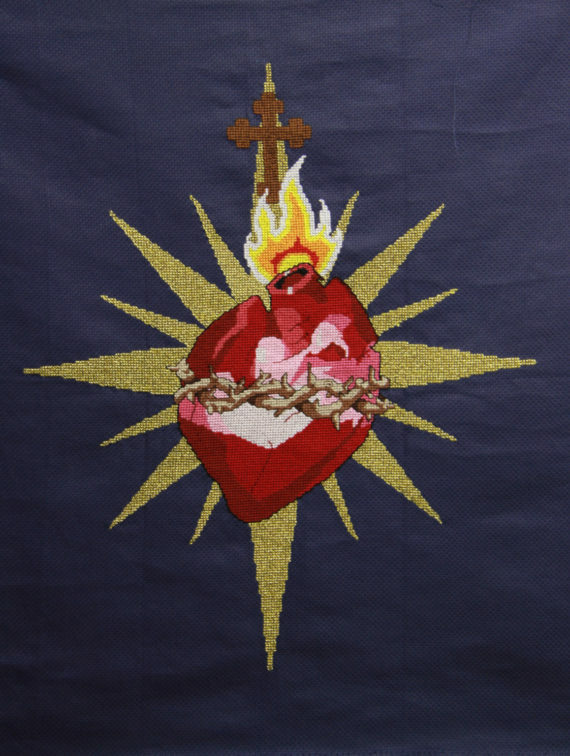 My first big Contemporary Art Cross-stitch project began late in 2014. I applied for and was awarded funding for the project, which involved free Contemporary Art Cross-stitch workshops, a participatory project, and the undertaking of my own large scale piece of work. In this blog I will be writing about my own piece of work, entitled The Thread of Life. This project was inspired by my work Labyrinth (see previous blog post). I had been thinking for a long time how amazing it would be to cross-stitch a full size maze, which could be hung from the ceiling with long threads hanging down to the ground forming pathways which you would walk around. For many reasons this would be impractical, but the idea stayed with me. I also had been thinking for a long time about the Three Fates from Ancient Greek Myth, who are said to spin each person’s thread of life, thus determining how long they would live for. This made me think of our DNA, and how that can determine what happens to us in life. These ideas came together as I started to think about making work in cross-stitch which is appropriate to the medium. I started thinking that Aida, the grid like fabric used in cross-stitch, would work very well as a kind of mosaic, and I started to think about crumbling Byzantine domes with areas of exposed plaster. 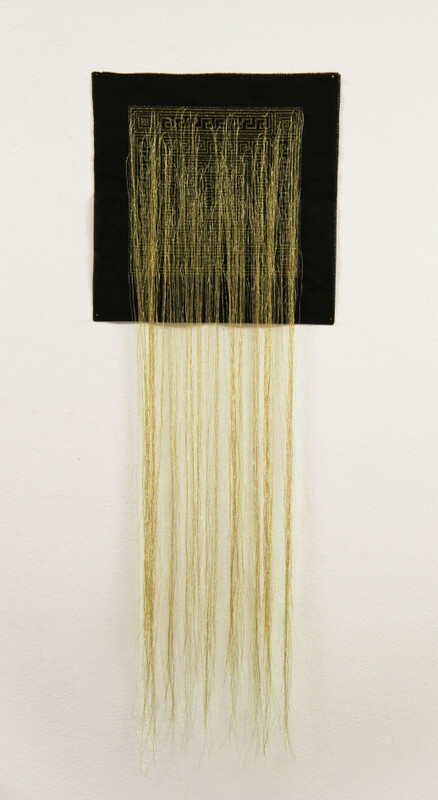 I decided to put the theme of the Three Fates and DNA, together with the idea of work suspended from the ceiling with long threads hanging down to the ground. I wanted to use gold metallic thread to give an ethereal feel to the space created inside the threads. I gave myself one year to complete the project, which was a conceptual piece of work based on the idea of time. I like how unfinished cross-stitch work looks, but had never had a reason to present something unfinished before, so this was the perfect project. I think that, in unfinished work, you can appreciate the craftsmanship rather than just looking at a finished “picture”. This piece of work would be presented exactly as it was left after one year’s work. The fabric was painted with clay to give the look of a crumbling Fresco. Pantocrator (set in a ceiling dome). 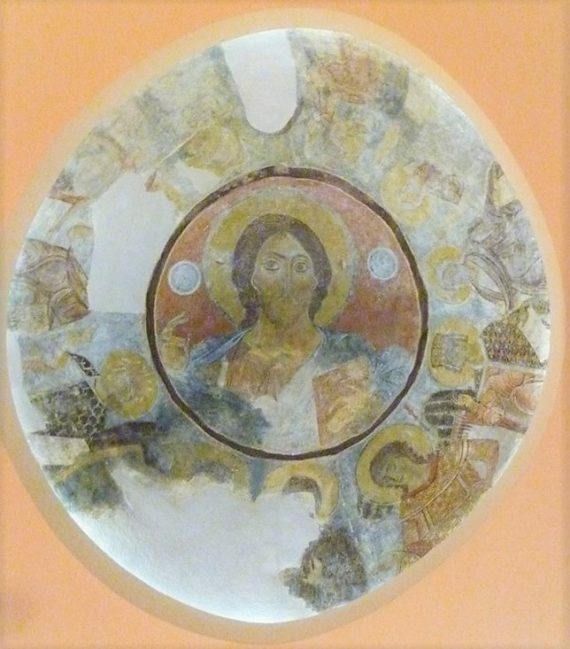 Byzantine Museum. Athens. Motifs of the tools relating to the Three Fates and their names were incorporated into the pattern. As was a heart, which I use in my work to symbolise death, and conversely life. A DNA strand runs around the edge of the pattern. The colour palate is based on traditional faded fresco colours, of blue, yellows and terracotta’s. 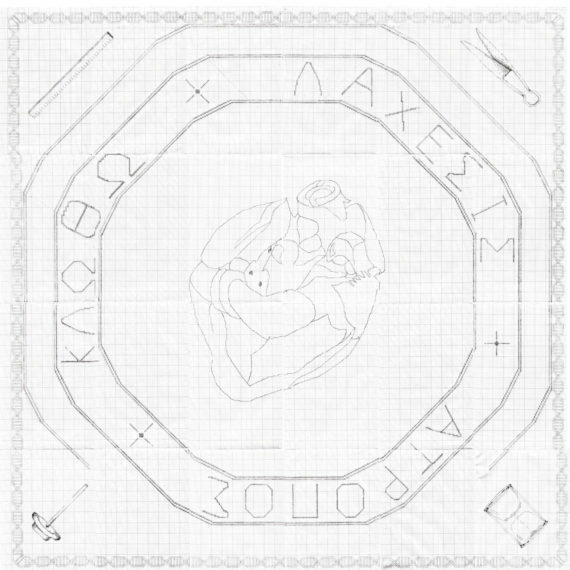 The pattern was drawn up on 24 sheets of A4 graph paper and the finished work is approximately one square meter.